Please join the History on Film Club today at 2:30 in the lecture hall to see Race. Jesse Owens quest to become the greatest track and field athlete in history thrusts him onto the world stage of the 1936 Olympics, where he faces off against Adolf Hitler’s vision of Aryan supremacy. It’s Teen Tech Time in the Media Center. If you want to learn about 3D pens then sign up to attend the 3D Pen workshop Thursday during AEP in the Media Center. You must sign up for a pass in advance from the Media Center. All participants will be entered into a drawing for a gift pack from GizMoes. If you like to rebuild computers, load software or want to see how a computer works, join the VASTAR computer refurbishment group on Wednesday, March 1st immediately after school in room 104. See Mr. Aadahl in room 104 for more information. At the state Championship 4A track meet Conrad Steck was 2nd in the 1600 meter run. Conrad Steck along with Isaiah Woo, Chris Collins and Devon Underwood placed 4th in the 800 meter relay. Serenity Chavez was 5th in the 1,000 meters. Jax Palmer was 6th in the pole vault. Rashawn Smith was 7th in the 55 meter dash. LHS has a new program to help minimize the amount of electronic device thefts – “RYED”. The Register Your Electronic Device program is a simple and free protection plan for your devices. You may take your electronic device to Officer McLaughlin to have the serial number, make and model of your device registered. Please see Officer McLaughlin for more information about this new program. 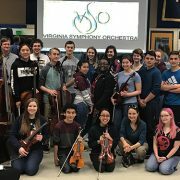 The Virginia Symphony Orchestra coaches the Lafayette Honors Orchestra in preparation for District VIII Assessment. Bayport members stop by our table during your lunch to see what games we have in store. If you’re interested in becoming a member stop by the Bayport window for more information. If you like to rebuild computers, load software or want to see how a computer worksl join the VASTAR computer refurbishment group on Wednesday, March 1st immediately after school in room 104. See Mr. Aadahl in room 104 for more information. Homemade brownies are on sale each day between 1st and 2nd block in the upper commons for $1.00. Please join the History on Film Club on Tuesday, Feb 28th at 2:30 in the lecture hall to see “Race”. Jesse Owens quest to become the greatest track and field athlete in history thrusts him onto the world stage of the 1936 Olympics, where he faces off against Adolf Hitler’s vision of Aryan supremacy. The Lafayette Theatre Department is looking for students that are interested in working tech for our musical. If you want to learn about sound, lighting or work backstage then come to our theatre tech meeting on Wednesday, March 1st after school in the auditorium. Please see Mrs. McCorry in room 623 if you have any question. The LHS Book Club will be meeting this Friday during AEP. Please bring your copy of Ten with you. 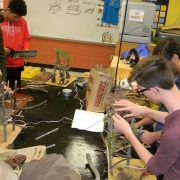 Mr. Aadahl’s Architectural Drawing & Design students study organic design and shelters by building treehouses with found materials. The VASTAR computer refurbishment group will meet immediately after school today in room 104. Students who have helped over the past 3 years or new students may attend. Students who participate will have the opportunity to earn a T-shirt and digital badges that represent certifications based on your level of participation. Activities may include computer repair, software installation and coding. See Mr. Aadahl in room 104 for more information. The LHS Book Club will be meeting this Friday during AEP. Please bring your copy of “Ten” with you. Girls soccer tryouts are today at 3:00pm at the WISC. Anyone interested in becoming a part of the outdoor track team needs to meet with Coach Jones in the upper commons today at 2:30. You must have a current physical. Come ready to practice. The VASTAR computer refurbishment group will meet immediately after school on Wednesday, Feb 22nd in room 104. Students who have helped over the past 3 years or new students may attend. Students who participate will have the opportunity to earn a T-shirt and digital badges that represent certifications based on your level of participation. Activities may include computer repair, software installation and coding. See Mr. Aadahl in room 104 for more information. On Thursday at the Regional Track Championship Jax Palmer won the pole vault with a personal record jump of 13 ft. Conrad Steck was 1st in the 1600 meter run. Brooke Crookston placed 1st in the 1600 meter run. The 4 by 200 meter relay team placed 2nd. Way to go Running Rams. Try-outs for Boys Soccer will begin on Monday, Feb 20th from 3:00 – 5:15pm. Students need to be at Warhill Practice field #4 with proper equipment and have a VHSL physical on file at the school to participate. See Coach Sorrell in room 304 if you have any questions. Girls Soccer Tryouts will be Tuesday, Feb 21st at 3:00pm at the WISC. Girls will not try out on Monday. Anyone interested in becoming a part of the outdoor track team needs to meet with Coach Jones in the upper commons at 2:30 on Tuesday, Feb 21st. You must have had a physical exam. Come ready to practice. Interested in playing boys tennis? There will be a meeting right after school on Tuesday, Feb 21st in the lecture hall. Anyone interested is encouraged to come. Congratulations to Junior Astrid Stanley! 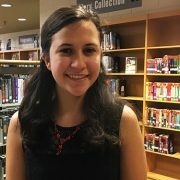 Astrid recently qualified for the All-Virginia State chorus to be held April 27-29 at Virginia Tech. Astrid finished at the top of her Alto I section for our District!